Browsing Category: Perennials Displaying 1-2 of 2 Found. $17.95 This is a perennial that looks like a small shrub since the stems are woody. Makes a mound to about 3 feet & is happiest in a rock garden or extremely well-drained soil in a sunny site. Actually prefers poor soil to rich & is happier with the addition of some lime. Often planted in the south in the fall, overwinters, & flowers in the spring. 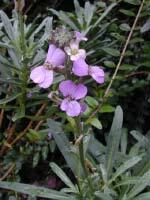 Erysimum ’Bowles’ Mauve’ declines in the heat of summer & "should not be expected to persist more than two years." (Dr. Armitage) Think "pansies" only taller and I think prettier. Zones 7 - 8.